Don't forget your swimsuit during good weather! The Westin at The Woodlands features a gorgeous pool. Our Grade: B+. While some of the staff could have been more engaging and prices on bar snacks were simply too expensive, time flew by far too quickly at well-appointed The Westin At The Woodlands. A three-day stay is recommended; one day was just not enough. The hotel is surrounded by many options for eating and drinking and is next to the Woodlands Waterway, which is perfect for relaxing morning and evening strolls. When counting the blessings of living in the Greater Houston area, one of them is certainly the ease of having a great “staycation.” There are many options both inside the city and in its many fine suburbs where finding a great hotel surrounded by interesting things to do and excellent places to eat is entirely possible. Of course, everyone is looking for something different when it comes to activities and hotel amenities. We were invited to check out one of the newest hotels, Westin at The Woodlands, which just opened this past spring. Packed with modern design features from the lobby to the rooms, it still has that fresh, new construction air about it. The hotel is right next to the Woodlands Waterway (perfect for morning and evening strolls) and with plenty of dining and entertainment options nearby. The Westin itself is home to Current, a respectable restaurant that’s great for a convenient weekend brunch, and Sidebar, the upstairs cocktail lounge. That said, the standards for “standard” rooms at the Westin at The Woodlands are very high. One of the benefits of staying at a newly-constructed, upscale hotel is that the rooms have the features that modern travelers are looking for. At the Westin at The Woodlands, road warriors (and those who may have to work even when they’re technically “off”) will be grateful for the long, curved desk and efficient deck of plugs and USB chargers mounted to the front right corner. Even standard rooms at the Westin in The Woodlands are smartly appointed with a generous work area, high-tech lighting system and mini-fridge, among other things. The rooms also sport the most high-tech lighting control system we’ve seen, both in the bedroom and bathroom. All lights are controlled through central, touch button panels. The main room lighting controls are on the nightstands, which makes it especially convenient at bedtime. There are no mini-bars (at least, not in the regular rooms) but there is a menu of the same kind of snacks and drinks one might expect to find in one. That means the small refrigerator is completely empty, which is great for those who want to store their own drinks or food in it. One needs only call to have these items brought the room and there’s regular room service as well. The bathrooms feature standing showers lined in rectangular tile in an attractive wood grain pattern that looks similar to white ash. Guests can make their own, warm, virtual rainstorm with the huge, square showerhead and there’s even a separate sprayer for those hard-to-reach places (whether on yourself or someone else—we won’t judge). Here are some of the other amenities. All in all, it’s a well-rounded package of services and features. The bath products are “the usual suspects”: soap, shampoo, conditioner and lotion in a pleasant white tea and aloe scent. A white microfiber bathrobe; instead of typical terrycloth, it’s made of velvety white cotton. We found these available for purchase online and, of course, guests of the hotel can buy these onsite if they find they can’t part with them. Sidebar has a surprisingly ambitious cocktail program for The Woodlands and there are certainly no complaints about the airy, sophisticated digs, or how to get to them. There’s a dedicated elevator on the patio near the Waterway. Alternately, there’s also a spiral staircase one can climb up from ground for where Current is located. Once on the second floor, it’s well worth getting one of the well-made cocktails and heading outside to the spacious patio, which is also where the gorgeous pool is located. Even someone who doesn’t swim would still want at least dangle their toes in it. 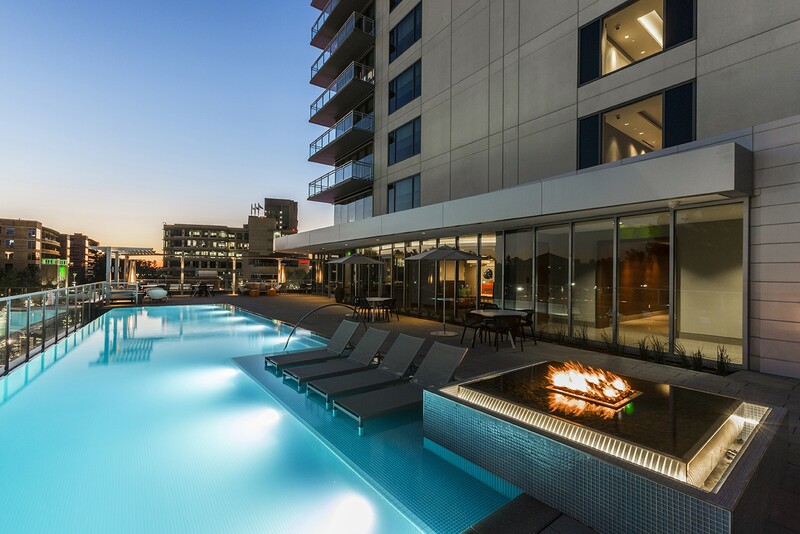 There’s a “fire and water” feature at the end of the long, rectangular, inset pool—a fire pit with a flowing fountain built around it. Surrounding the pool are plenty of places to lounge and sit; there are even chaise lounges on a platform in the pool itself. We managed to catch the tail end of the summer cocktail list; the fall one is now on deck. We can’t attest to these since we didn’t get to try them, but even a glance at the new list reveals the classic flavors of autumn are in full effect. Tuber and Root is vodka-based, includes sweet potato pureé, ginger liqueur, piloncilo syrup (piloncilo is an unrefined sugar popular in Latin American cuisine that still has the molasses in it) and is topped with ginger beer and a “vanilla bean toasted marshmallow.” We can’t wait to go back and try that one (but if you get to it before we do, shoot us an email and let us know how it was). Overall, Sidebar was enjoyable although there are a few areas that need improvement. The snacks, including housemade seasoned chips and a cheese and fruit plate, were quite good but at “hotel prices.” The chips came with three different dips: housemade onion dip (our favorite), buttermilk herb dip and good ol’ ketchup. Still, $9 seemed a dear price to pay for chips and dip. The cheese plate seemed scanty for $18, although the three selections—one infused with habenero, another with a coffee-rubbed exterior and a mystery cheese that the staff called “cheddar” after being asked (it wasn’t) were of excellent quality. No one explained what the cheeses were when the plate was dropped off. The staff seemed busy doing prep work for the evening and weren’t very engaging. There wasn’t any voluntary communication or enthusiasm about discussing the food and drink program. Still, we’d happily give Sidebar another chance in the future; it’s worth it. Like all the rest of the Westin, the in-house restaurant, Current, sports airy, spacious design features, like big windows and sculpture-like, curved columns made of natural wood. It just couldn’t be easier to wander downstairs and close out the weekend over Sunday brunch. While a few minor tweaks would be welcome, Current’s elegant fare makes it worth checking, even for locals who are not staying at the Westin. The nearly crepe-like blueberry pancakes at The Westin at The Woodlands’ in-house restuarant, Current, are a must-order brunch item. The bacon’s too thin and flabby to get excited about, unfortunately. The thin blueberry pancakes were divine. The batter, which existed in a nebulous realm somewhere between crepes and cake batter, was laid down in exactly the thickness of a single layer of blueberries. That excellent proportion created a latticework of sorts, with pale yellow pancake holding the purplish berries in thrall. The side of bacon, unfortunately, could have come from a buffet steam table, even though Current’s brunch is a la carte. We couldn’t get enough of this corn soup, tinged with the warming heat of chipotle pepper. The warm corn soup was similarly outstanding. Deep, sweet flavor was amplified with the heat of chipotles. There was an ample handful of whole kernels of corn to provide the needed texture and a heap of frilly microgreens on top that actually added color and flavor. Current’s thick onion rings, darkly streaked with Guinness stout, are some of the most flavorful and artistic examples we’ve ever seen. The Black & Tan Onion Rings should accompany any lunch order. The attractive rings get their stripes from a last drizzling of Guinness-infused batter. That also means that the beer batter actually does taste like it has beer in it, which is a rarity. A few of the dishes at Current are “close but no cigar.” Chilled potato-leek soup was a great idea for the last throes of summer, but sorely lacked actual leeks. The nubby texture of the coarse cornmeal used for the Shrimp & Grits is incredibly satisfying in a tactile sort of way, but a little more seasoning would have been welcomed. Conversely, the Cajun seasoning applied to the sizable tail-on shrimp was excessive. A couple brunching at a nearby table who struck up a conversation with us ordered the same dish and said they had the exact same issue. While the dishes aren’t all necessarily perfect, brunch was still an interesting and satisfying experience. Current is a ambitious restaurant, not one of those hotel eateries that treat patrons like a captive audience. There’s a public garage just a short distance away so it’s hard to justify the $25 valet-plus-tip unless there’s a lot of baggage. Supposedly, the cost for the garage is $15 but the gates were up on the weekend we visited, so there turned out to be no charge. The Cynthia Mitchell Woods Pavilion is a mere half-mile walk down the waterway, so it’s ideal to schedule a hotel stay right after a Friday or Saturday night concert. It’s so much better than making the long drive back to Houston—or wherever you’re from. For morning coffee, skip the in-room brewer and take a short drive to Whole Foods at the nearby Hughes Landing shopping center instead. There’s a full espresso bar there manned by trained baristas. Afterward, consider a walk around the lake that runs behind the shopping center. There are even kayaks available for rent starting at 9 a.m. on the weekends. Stunning, destination-worthy dining in The Woodlands is at Cureight. It’s a special tasting menu restaurant nestled within Hubbell & Hudson, a mere block away from the Westin at The Woodlands hotel. Just a short drive away is Fielding’s Wood Grill, home of juicy, grilled burgers, mighty fine bloody marys and a great craft beer selection. In the mood for dessert or a light breakfast? Head to the Woodlands outpost of Crave, a bakery that specializes in light breakfast pastries and big, decadent cupcakes. The day we spent at the Westin at The Woodlands zoomed by far too quickly. Other than going out to dinner, we spent the entire time either in the hotel or walking around the Waterway—and were sorry to have to leave. Our biggest regret was that we failed to bring swimsuits so we could take a dip in the splendid, clear pool. Don’t make the same mistake. For anyone who is seeking a peaceful weekend or a lovely place to crash after a concert or event in the Woodlands, the Westin is a great choice.